The residents of Panam Nagar remained unbent on vacating their houses and many of them continued throwing up new structures 15 months after the government declared the old town as a archaeologically preserved site. 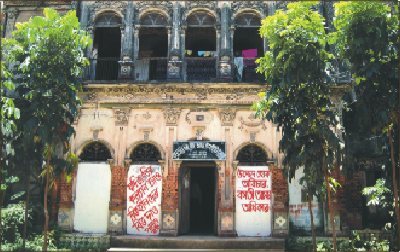 Panam Nagar, known as 'Haveli Sonargaon' at the height of its glory, is now home to 50 opulent ancient buildings made of small bricks on both sides of a road surrounded by a trench in Narayanganj district. In the face of continued demands from archaeologists, architects, newspersons and cultural activists, the government invoked the Antiquities Act 1968 to declare the town as a protected site. "We are living here for the last 40 years. Now it is our home, our hope, our everything. We cannot leave it for the sake of heritage," Maya Begum, president of Panam Women Association, told The Daily Star. 'The government should permanently allocate these houses to us rather taking them away from us." The graffiti on most buildings in the historic town echo the same sentiment. "We will sacrifice our lives, Not Panam," reads one. "It's our right to live here," proclaims another. From the end of the 19th century to the beginning of the 20th, Hindu landlords and merchants put up the residential quarters on both sides of the road, bringing together contemporary Mughal architecture and grandeur. Two bridges on the Pankhiraz canal between Dulalpur and Panam add to the archaeological riches of the old town. The residents of Panam Nagar have been living in the historic buildings since 1965 when the original owners left them behind during the Indo-Pak war. The current residents leased the buildings, treated as vested enemy property after the war, for 99 years from the government. In March 2003, the president directed the authorities concerned to list the structures on more than 10 acres in Sonargaon upazila in Narayanganj district. But the government's step to protect the heritage is so far limited to the official declaration. "We have just submitted a project concept paper to the government for the preservation of the town. The government will probably include the project in the next Annual Development Programme," said Dewan Delwar Hossain, the director of the archaeological department. "When the government will take the project, we will discuss the matter with local residents and convince them to shift to somewhere else." "Virtually we are yet to do anything with Panam Nagar. But hopefully in the next year we will be able to start renovations to the relics and preservation of the town," he added. After the declaration of the old town as a protected site, some local residents continued putting up new houses in the preserved area with the intent of making some quick money in damages from the government during eviction. The new structures appeared incongruous with the historic buildings standing in virtual ruin with the images carved on their pillars and walls were peeling off, doors and windows rotting and rickety cast iron grills falling apart. But some local residents underscored the value of the heritage they were destroying by careless use as residential houses and trade centres. "It's really a laudable decision of the government for the protection of our heritage. But people, afraid of not getting proper compensation, are planning protests against the government decision," one of them said, requesting anonymity. Archaeological department sources said they would conduct a survey in the area to find out real property owners. "Compensation will be given to real owners," Dewan said.